Keratoconus is a non-inflammatory eye disease in which the normally round dome-shaped cornea progressively thins causing a cone-like bulge to develop, usually in the inferior portion of the cornea. The condition almost always affects both eyes. However, it is usually worse in one eye than in the other. Corneal thinning is most marked at the apex of the cone. Corneal thinning and protrusion results in significant irregular astigmatism due to the distorted shape of the cornea. The cornea is the clear front portion of the eye and is responsible for focusing/refracting most of the light coming into the eye. Therefore, abnormalities of the cornea, such as keratoconus, severely affect the way we see the world; making simple tasks, like driving, watching TV, or reading a book difficult. In its earliest stages, keratoconus causes slight blurring and distortion of vision and sometimes increased sensitivity to glare and light. These symptoms usually first appear between the teenage years and age 30. Keratoconus then progressively worsens during the next 10-20 years after which time it remains relatively stable with little worsening. Each eye may be affected differently, and the progression is unpredictable. The actual incidence of keratoconus is unkown, but not rare. 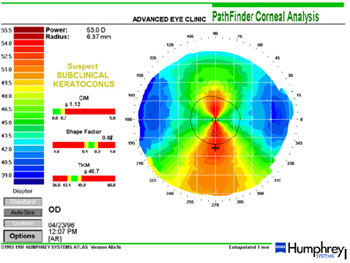 Since the introduction of corneal topographers and the Orbscan II in particular, it is much easier to make an early diagnosis of keratoconus. Because virtually all LASIK and refractive surgery patients undergo this testing prior to a refractive procedure we have learned that many more people have keratoconus than we previously believed. The exact etiology of keratoconus remains an enigma. Most evidence suggests hereditary factors. Keratoconus is also associated with many conditions including retinitis pigmentosa, bilateral macular coloboma, aniridia, blue sclera, Down syndrome, Addison disease, Marfan syndrome and osteogenesi imperfecta. It also coexists with congenital rubella, floppy eyelid syndrome, false chordae tendinae of the left ventricle (found in 75% of patients with keratoconus). The most positive correlation is with atopic disease. Studies have found asthma, eczema or hayfever in 35% to 53% of patients with keratoconus compared to only 1-12% in the control groups. Eye rubbing is also very highly associated with keratoconus and in fact has been suggested as a cause of keratoconus. Several studies reported 66-70% of keratoconus patients were eye rubbers. Some of this eye rubbing however is due to contact lens wear and dry eyes. The biological cause of the thinning cornea is postulated as reduced protein in the corneal layers causing abnormal levels of proteinase activity that results in the gradual loss of Bowman’s Membrane (one of the very thin layers of the five layer cornea) and the epithelial basement membrane. Others believe that there is an increased collagenase activity that causes a breakdown and loss of collagen fibrils of the thickest corneal layer, the stroma. Keratoconus can be difficult to diagnose in its early stages and is almost always missed unless corneal mapping (video keratography) is performed. 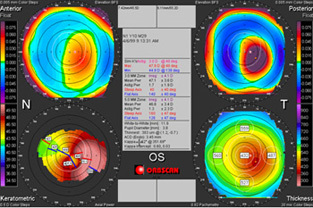 See the two displays below showing corneal topography results of keratoconus patients using two different instruments. A patient initially reports with blurred vision in the early stages that may still be correctable with eyeglasses. As the condition progresses the best corrected spectacle vision worsens. Other symptoms that may be present are light sensitivity and tired, irritated eyes. In severe cases a person may experience extreme pain due to corneal hydrops. 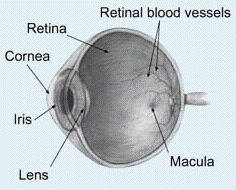 This is a condition in which the cornea swells and begins to blister. Symptoms associated with this are a sudden decrease in vision, pain, red eye, light sensitivity, and profuse tearing. Eyeglasses or soft contact lenses may be used to correct the mild nearsightedness (myopia) and astigmatism that is caused in the early stages of keratoconus. As the eye disorder progresses and the cornea continues to thin and change shape, rigid gas permeable contact lenses can be prescribed to correct vision more adequately. The contact lenses must be carefully prescribed and fitted by a skilled, experienced optometrist. Frequent check-ups and lens changes may be needed to achieve and maintain good vision. Most medical insurance pays for these special lenses because the contacts become a medical necessity. Advanced keratoconus causes blurred vision that cannot be adequately corrected with glasses or soft contacts in most cases. The eye care doctors at Master Eye Associates are very experienced and skilled in treating keratoconus patients. 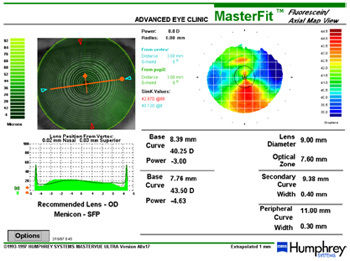 We utilize both the Orbscan IIz and the Humphrey corneal topographer in diagnosing and prescribing computer designed contact lenses. Refer to the printout below. 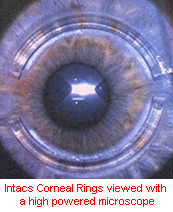 If the cornea becomes too distorted and irregular it is probably advisable to use intrastromal corneal rings (Intacs) to stabilize the protrusion and attempt to round out some of the corneal irregularities. There is only a small percent of corneal specialists that are experienced and certified in this procedure. Those surgeons work with Master Eye Associates doctors on these and other serious corneal conditions. In severe cases, a corneal transplant may be needed due to scarring, extreme thinning, or contact lens intolerance. This is a surgical procedure that replaces the distorted and thin cornea with healthy donor tissue.